Gerard Pique, Ivan Rakitic, Jordi Alba, Lionel Messi, Nelson Semedo, Philippe Coutinho, Luis Suarez, Sergio Busquets, Samuel Umtiti, Marc Andre Ter Stegen & Ousmane Dembele. All the figurines are featured on PURPLE base exclusive to this pack. These three box sets are limited to a total of 1,290 pieces. They celebrate Barcelona winning an historic treble in 2015 - LA Liga, Copa Del Rey and the Champions League. Claudio Bravo, Thomas Vermaelen, Gerard Pique, Ivan Rakitic, Andres Iniesta, Dani Alves, Marc Bartra, Marc-Andre Ter Stegen, Pedro, Jeremy Mathieu, Sergio Busquets, Luis Suarez, Lionel Messi, Neymar Jr, Xavi, Jordi Alba & Javier Mascherano. 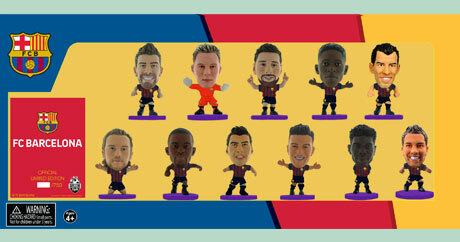 • Pack C the Jordi Alba away kit figurine. Jeremy Mathieu is exclusive in this box set painted in the Barcelona 2014/15 kit. All Soccerstarz in this limited edition box set are on GREEN base. 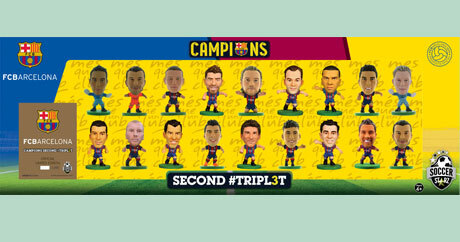 Victor Valdes, Carles Puyol, Gerard Piqué, Cesc Fàbregas, Andres Iniesta, Xavi Hernandez, Lionel Messi, David Villa, Dani Alves, Sergio Busquets, Thiago Alcantara, Pedro Rodriguez, Alexis Sanchez, Jordi Alba & Alex Song. Messia & Song featured on exclusive BLACK base. 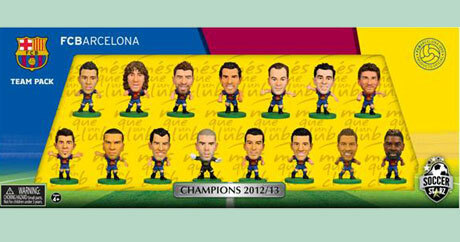 All other Soccerstarz in this limited edition box set are on GREEN base.